Review by: Richard Pauls, Winnipeg MB. Richard Pauls has been riding on and off for 25 years. From learning on the family Honda CT70 to a borrowed Yamaha FJ1100 to get to school, 2 wheels and a motor have always put a smile on his face. Wanderlust has temporarily been replaced by playing with his young kids, but these future riding partners won't have long to wait before joining in on his adventures. The commute on his KLR650 is a short trip of dodging cars in downtown Winnipeg, but he often daydreams of dodging goats in a foreign land alongside Ewan and Charley. 101 Road Tales, written by Clement Salvadori. Popular motojournalist Clement Salvadori has been sharing stories from the road on a monthly basis with the readers of Rider magazine since 1988. Now, 101 of those engaging Road Tales have been brought together in one book and illustrated with 101 black and white drawings by his long-time friend Gary Brown. …without going for a ride between chapters. Go ahead, pick it up again – but keep your helmet and gloves nearby, because you’ll soon find yourself back on the bike. Mr Salvadori’s love of riding is infectious. The bike doesn’t matter, the road doesn’t really matter (but the curvier the better! ), the weather doesn’t matter. He’s riding and that presses all the right buttons. His other loves include food, good coffee, and cheap ma + pa motels. Did I mention food? He’s a rider’s rider, riding in heat, rain or cold and exploring interesting trails with bikes meant to cruise the interstate at 75 for weeks at a time. Along the way he learned some lessons and writes to us about the wisdom he’s gained, without promising to not make the same mistake again. Clement covers topics we motorcyclists enjoy sharing our 2 cents with other riders. Maps vs. GPS; breakdowns; waving; and simply trying to answer the question of why we ride. Each chapter is actually a selection from his magazine columns, so there is some overlap and repeated mention of his epic trips and especially his first bike. I know this review is short – but I need to go for another ride before it gets dark. Thank-you Mr. Salvadori, for reminding me what fun it is to go for a simple ride! The book was published by Whitehorse Press Publishing in April 2008. It's a hard cover book that would be a welcome addition to any motorcycle enthusiasts library. It has a suggested retail price of $24.95 USD and you can get it from Whitehorse Press or you can get it for a discount via the Canadian Motorcycle Riders bookstore on page 28. It's eligible for Amazon's free shipping deal too. My opportunity to ride and review the Monster S4RS comes by way of a good friend of mine... Obviously he's a good friend because he let me take his very shiny and nearly new Monster for a few days to put a few kilometers on it. You see I was visiting Nova Scotia from Winnipeg, Manitoba to get married. I'm also moving to Halifax in a couple of weeks time (anybody looking for a IT guy who loves motorcycles?). This friend was the best man at my wedding. Best man indeed! I took the bike from Halifax, Nova Scotia to Shelburne and a did a return trip as well. It's about 210 km's from Halifax to Shelburne if you go straight through. I had 3 glorious days with the S4RS and managed near a thousand kilometers of seat time. I would have liked more but, well - you know, there was a wedding I had to get ready for. My two hour ride from Halifax to Shelburne that I managed to turn into a 4 hour ride was somewhat of an indulgance. I took the direct route back to Halifax. Let me say this, I enjoyed every single minute of riding this bike! 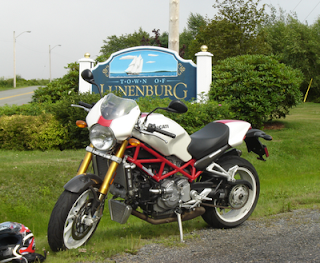 Even the several km's of ripped up road surface (it was being prepared for paving) that I rode on to get a picture of the Lunenburg, Nova Scotia sign and the Ducati! Is it practical? Nope - not really. Gas mileage? Terrible - you're going to be very familiar with where all the gas stations are. Inexpensive? No - definitely not. Will you care? I can emphatically say - You won't care at all about these things. I had a fantastic time on this bike. It oozes quality, performance, and sexiness. The color scheme for my test bike was white pearl with a red stripe down the middle. There's a removable passenger seat cover too. The S4R S is an attention getter. I know the bike looks good but I was a little surprised at just how much people are drawn to it. Just about everywhere I stoped people came over to talk to me abut the bike. There aren't too many of them around in NS and perhaps that added to the interest in the bike. 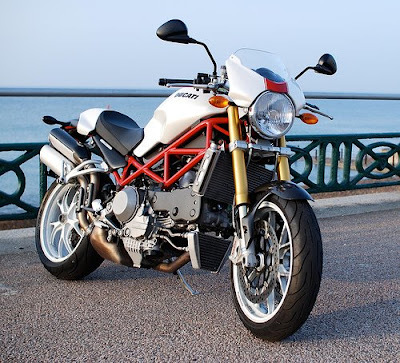 The Monster S4R S is the upscale Monster. It's an uncompromising naked superbike; it's covered in carbon fiber bits and features top spec equipment in abundance. When you sit on and ride you'll know where the money went. It feels like its price which is in the neighborhood of $18,000. Pictures don't really do it justice. You can't fully appreciate it until you get up close and examine it. Count on making some new friends! 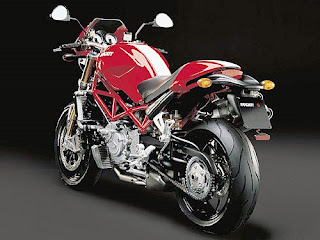 It includes standard Monster styling cues such as single sided swingarm, small upper fairing, vertically stacked twin exhausts, and longitudinal stripe (bigger and centrally positioned on the S4R S). I stopped at several gas stations during my time with the Monster and most of the times people came up to me to to chat about the bike and where I was headed, what I was doing etc. Some were fellow motorcyclists and some were just admiring fans. I'd like to say that it's me that was attracting all the attention, but I know better! One of the countless things that make this bike special is the 130 hp, 998cc L-Twin engine. Now, 130 HP may not seem like a lot but this bike seems to be barely moving at 110 km/hr and it will pull strongly well above that. It's solid and planted as a tank at speed even in wind, except that it only weighs in at svelte Ducati listed weight of 390 lbs. The engine is very forgiving and delivers power so smoothly it's tough to drive it slowly, only because you'll feel like you're barely moving. 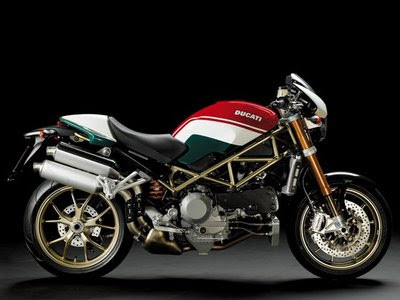 In that regard it's much like the other Ducati's I've ridden lately - deceptively fast! You need to keep an eye on the speedometer to make sure you can keep your licence and get to ride another day. The L-twin offers tons of power and produces gobs of torque (76.6 lb-ft to be exact) and forward momentum at anything over 3,000 RPM. The rumbling L-twin sounds fantastic, particularly with the twin termingioni's that were fitted to my tester. You can drive this bike in a reserved manner, but I challenge you to do it. A tiny twist of the wrist ensures you're exceeding posted limits rapidly with no feeling that the power will taper off any time soon. The mirrors are decent and in a good position. Your body doesn't block your view. It's just tough to see things out of mirrors when you're not stationary because of the rumbling L-twin. You KNOW you're on a twin. You can feel the vibration in your seat, in the pegs, and in the bars. It gives you a distinct sense that you've got a lot of power on tap. Twist the throttle hard and that sense of power is confirmed. You can lighten the front wheel pretty easily. The termi's begin to sound like booming cannons when you crack open the throttle. I imagine the cars you're passing can feel the percussion as you swiftly and effortlessly blast past them by. There will be no lazy passing on this machine! Of course, the S4R S has the famous dry clutch that some Ducatisti say is the only way to go. The adjustable clutch lever pull is smooth, light and the shifting is buttery smooth. Not quite as light as the 696 but that's the lightest clutch pull of any bike I've ridden. The clutch shifts almost effortlessly. There is absolutely no clunking when the gears engage. What you will hear is lots of clickety clack noises though; a characteristic of the dry clutch. Embrace it - you'll quickly learn to love it! I've read some reviews that say the clutch pull is tough. I don't know what those guys are talking about... They've obviously never spent any time on a Suzuki GS 500. The clutch pull is light! Either that or my left forearm is bulked up from the GS! In the cockpit you'll see large white faced, side-by-side analog, tachometer and speedometer gauges that quickly provide the most important information. There's also digital instrumentation that adds quite a bit of information such as trip meter, odometer, time and many other features. I honestly didn't even spend too much time exploring what the digital gauges provided; I felt compelled to drive it as much as I could. A bit of research shows that it displays speedometer, rev counter, warning light for low oil pressure, indicators for high beam, fuel reserve, turn signals, LCD clock, immobilizer. I found the seat is much more comfortable than the one on the new 696. It doesn't have the forward slope that tends to drive your sensitive bits into the tank. The large airbox and tank seems to indicate that you'll get a good distance down the road without having to stop to fill up - wrong! The tank is actually a plastic unit and only 14 L (of which 3 L reserve). The tank features nice cutouts for your knees that help you feel at one with the machine during spirited riding. They're a welcome feature because your knees/legs would be splayed out around the tank otherwise which would quickly become uncomfortable. Suspension is by way of a huge pair of 43mm upside down Ohlins shocks in the front; the rear end is equipped with an Ohlins as well, both are fully adjustable of course. The front suspension has a titanium nitride coating on the stanchions making things nice and slippery so they can do their job more effectively. I would be amiss if I didn't mention that being a naked bike you get to see all the beautiful and go-fast bits. That shiny red trellis frame, made of high strength ALS 450 steel tubing for example; very nice! And how about that triangular oil cooler and huge radiator. The wheels are super lightweight Marchesini Y-shaped 5-spoke that ensure outstanding handling by reducing unsprung weight, while 320 mm Brembo twin discs on the front have radial-mounted calipers with four pistons and four pads per caliper. You can bring this bike down from speed in a real hurry. The brakes make a strangely pleasing audible whirring sound as you rapidly decelerate. If you're looking for protection from the elements this isn't really the bike for you. It is a naked after all. The small front windscreen does do a decent job of deflecting some wind and I didn't feel uncomfortable or have much wind buffeting my head. I was riding in nice weather though. Lucky me! The riding position was comfortable; course I did have to stop to gas up pretty regularly so I got to move around and stretch before any discomfort could set in. It is a long stretch to the bars. I have long arms and found it suited me well. The bars are wide and feature no steering damper. I didn't feel like it was essential but it might help smooth out the turns a little. I didn't experience any headshake like I did on the Hypermotard S though. Course it wasn't nearly as windy and the roads I was traveling on were a lot smoother than in Winnipeg. I didn't like this bike. I LOVED it! The only fault I can say is that you can't get very far on a tank a fuel and perhaps that it's a tad on the pricey side. Having said that, the bike is built with very high quality parts and it shows. So it can be forgiven for being expensive. What it could use is a slightly larger tank. That's it really. Everything else on the bike is superb. If the Monster S4R S suits the type of driving you do and you've got the bank roll to have a focused purpose bike then I'd say by all means take one for a test ride. If you want to do a lot of long range touring, this probably isn't the bike for you. The bike is comfortable so you could easily go for some shorter over night or weekend trips but you'd need to plan out your route to stay near gas stations. 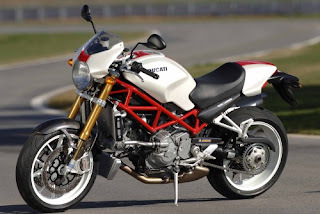 For more information on the Ducati S4R S feel free to check out the Ducati North America website.